The Murray State University Libraries invite you to honor the special people and occasions in your life with a book! 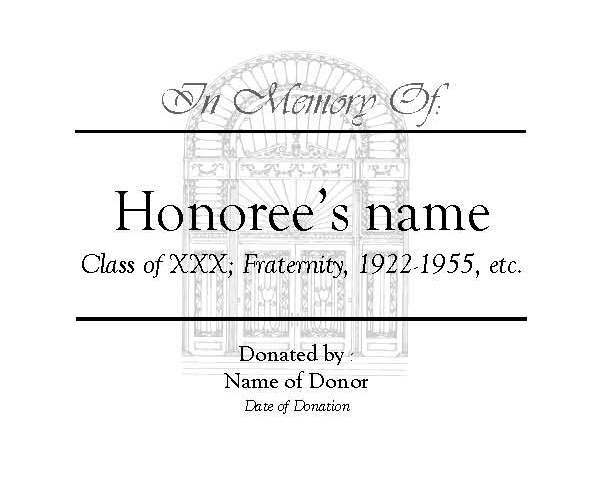 Create a lasting tribute by placing a bookplate in someone’s honor in a newly purchased book that will be added to the University Libraries’ collection in the subject area of your choosing. 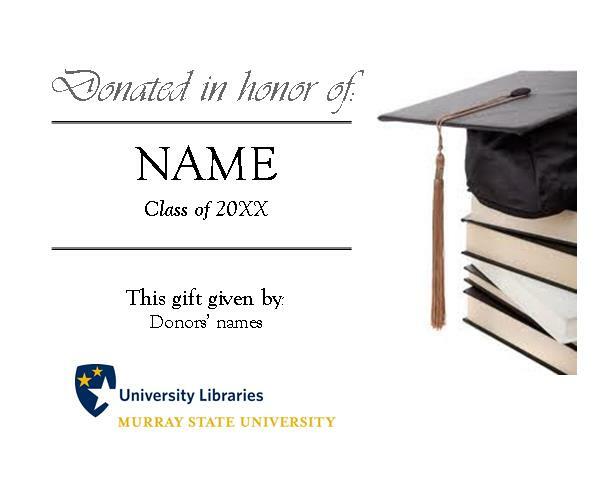 When you make your gift to the Murray State University Libraries Books of Honor fund, you and your honoree will receive a letter of acknowledgement with a copy of the bookplate and information about the title purchased. In addition, the bookplate will be incorporated into the Libraries’ online catalog system and will be available for viewing and searching. Gifts of $50 or higher to the Books of Honor fund will enhance the excellence of the Libraries’ collections while also making a legacy gift to Murray State. Just complete the form to select the amount you wish to donate and the area of study you wish to support. The University’s reference librarians will then select a title from the pre-identified list of needed resources for that area of study. University Libraries will purchase the selected item, it will be given a bookplate and added to the collection. Books of Honor is a perfect way to remember the people in your life for graduations, weddings, retirements, birthdays, anniversaries, memorial tributes, and other significant occasions. For questions about this or other donations to University Libraries, please contact Melanie Brooks in the Office of Development at (270) 809-3026. Thank you for joining us in our pursuit of excellence at Murray State University.